The What: IHSE has expanded the connectivity of its KVM solutions to include location-independent access over an IP interface. The new Secure IP Remote Access Gateway CON module connects the KVM matrix to private or public TCP/IP networks. The What Else: The IP module isolates the matrix and KVM system, and SecureCore technology prevents direct access to the matrix from the IP network. This maintains the integrity of the KVM system and is consistent with the IHSE philosophy of secure separation of core matrix and TCP/IP networks as an effective countermeasure to potential cyberattacks. HTML-5.0-based browser access provides flexibility for mobile devices, while Windows and Linux-based client software provides additional performance and functionality. The IP module offers high image quality with 1080p60 video signal at 8-bit color depth. 4K resolution with 30fps can also be achieved. At all resolutions, signal latency is below 50ms. With this solution, near real-time performance can be achieved without dedicated receiver hardware. Instead, the receiver is mapped as a receiving device using PC hardware. In addition, the network technology requirements are low: according to the company, the Secure IP Remote Access Gateway does not require elaborate multicast architectures, nor does it need the high bandwidths of equivalent systems. 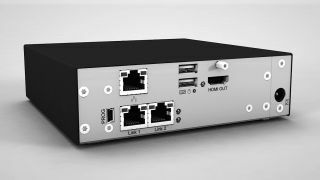 For installations that do not require full matrix switching capability, IHSE offers an IP module for direct computer connection, making it a suitable alternative for point-to-point connections. In this configuration, individual computers can be accessed and operated remotely via IP networks. Additional local outputs (signal feed-through) allow users to access the local computer at the same time. The Secure IP Access Gateway CON is designed for use with Draco tera KVM switches and is natively compatible with the Draco vario extender series and Draco vario chassis. In addition to remote access, it offers HDMI and USB interfaces for local access to rack or workplace levels. Variants for Cat-X and fiber optic cables are available, both in redundant formats. The Bottom Line: The Secure IP Remote Access Gateway CON provides remote users with secure access to closed and self-contained Draco KVM installations and provides high performance remote access to matrix-connected target devices via an HTML browser or soft client. IHSE’s KVM switching, extension, and sharing solutions are available for demonstration at NAB in Las Vegas, April 8–11, 2019 in booth SL9610. Orders for the new IP modules are now being accepted, and first deliveries will take place from Q3 2019.